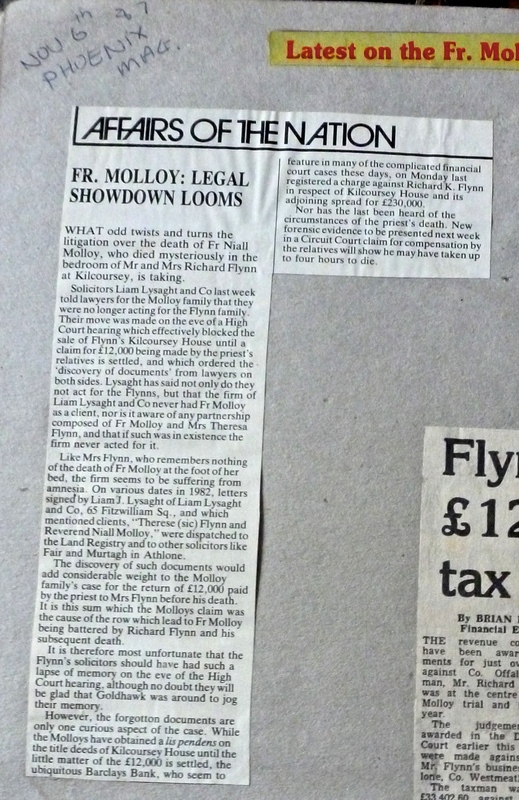 The funeral is taking place of Richard Flynn, the Offaly man accused of the manslaughter of Father Niall Molloy at his home in Kilcoursey, Clara on 8 July 1985. 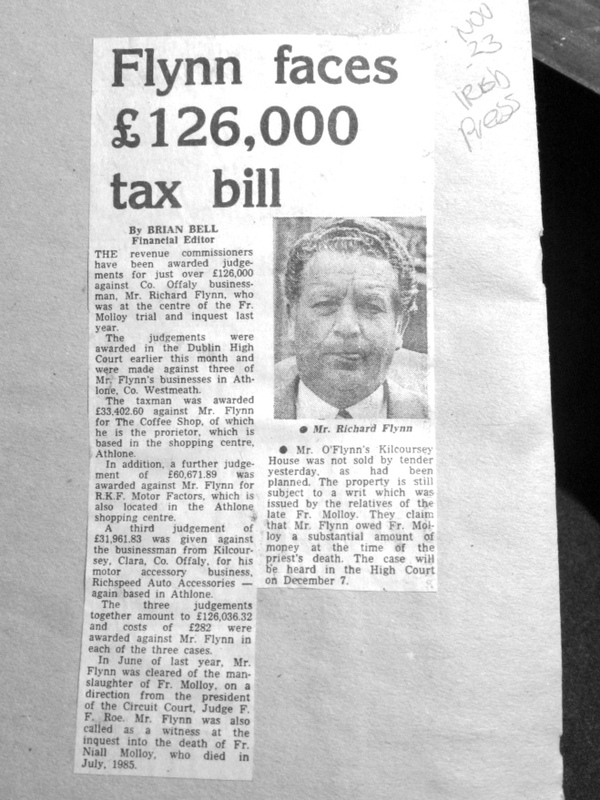 Mr Flynn and his wife Theresa were questioned by gardaí after the death of the Roscommon priest in the bedroom of their home in Co Offaly but the manslaughter charges against him never proceeded after a judge withdrew the case from a trial jury in June 1986. 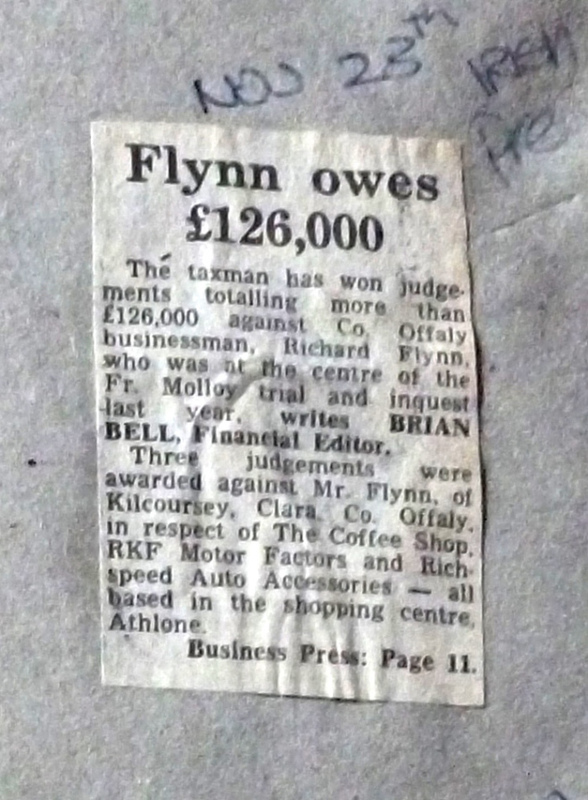 Mr Flynn had been ill for several years and died over the weekend. His funeral is being held today in Tubberclair, Co Westmeath. His remains will be interred afterwards beside those of his wife Theresa Flynn. Who did call the Doctor for Fr. Molloy ? Dr O’Sullivan from Kilbeggan was the Dr. who was called to Kilcoursey House to attend to Niall on the night of his terrible death. There is no doubt that O’Sullivan was in the house that night BUT there seems to be a lot of confusion as to who actually called him. Ian then went to the Tyrellspass Hotel and I spoke to him on the phone. He told me about his conversation with the Dr. and asked me if I knew who David Flynn was. I had not heard of him before that night. 183. Was David Flynn at the door ? 184. Didn’t you tell Ian Maher that David Flynn was the first one who woke you up ? The Gardai never picked up on these contradictions. Nor have Journalists who have gone through all the papers as I have. My late brother Ian was NEVER called as a witness despite all the valuable information he gave to the Gardai. There is no statement from him in the Book of Evidence. Why was he excluded ? SO WHO DID CALL THE DOCTOR THAT NIGHT ? There are other major contradictions in the statements from various witnesses. None of which seem to have been examined in any detail. I will be posting more in the coming days.